Part of the tools developed for my rendering for the SkySkan show called: Infinity Express, namely the Mars flyover sequences and the galaxy (2dF) fly-through. This document should be considered of "historical" interest only. The software described here has largely been replaced by this version of cube2fish. This note describes how material can be rendered and presented for the SkySkan full dome projection environments. The basic approach is that one needs to create 5 views of the scene each with a camera aperture of 90 degrees and each exactly at 90 degrees to each other, these views are called front, left, right, top, and back. This note will be concentrating on creating material from computer based rendering software and not photographically although the concepts are the same. The 5 images are processed by SkySkan to form a single "master" image, essentially an angular fisheye image (some rendering applications can create these directly). This master is then sliced up and sent to the projectors in different ways depending on the geometry of the particular dome. 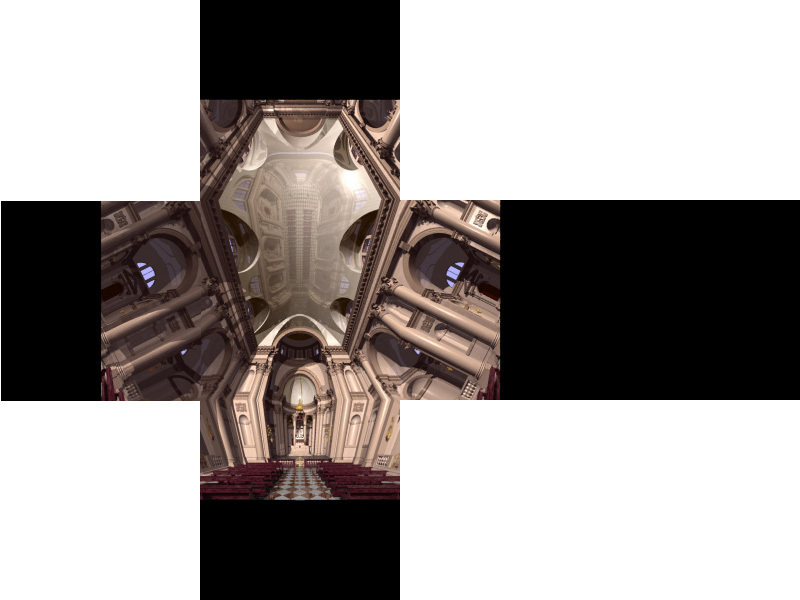 For example, the same master can be used to create a show for a partial dome as well as for a full dome. Most camera models for computer based rendering applications require that the camera aperture, view direction, up vector, and right vector are specified. The camera aperture for each view is 90 degrees, the following diagram illustrates how the views are orientated. The great beauty of creating images in this format is that almost any rendering package can be used. At the time of writing the images need to have their dimensions an integer multiple of 100 pixels. Low resolution images are around 800 pixels square, high resolution images are considered to be around the 2000 pixels square. Strictly speaking the bottom half of the left, right, back, and front don't need to be rendered, the images still need to be square but the bottom half can contain anything since it won't used to make the fisheye master. Could be submitted as follows with the corresponding reduction (2/5) in the render times. Unfortunately not all packages automatically render half frames, there are solutions to this restriction but they vary between packages and generally require some additional external programming. 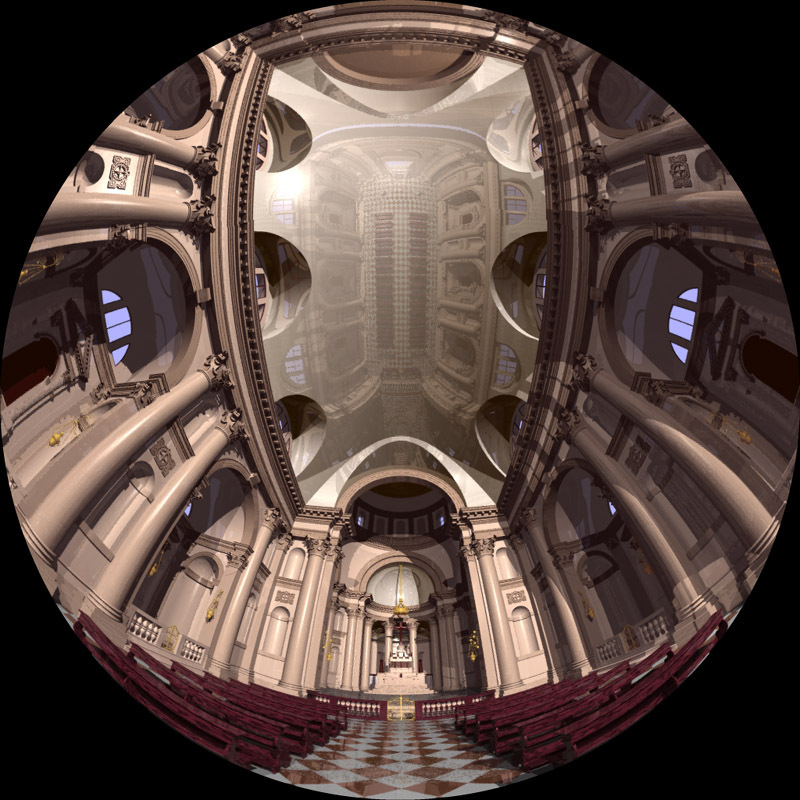 This example also clearly illustrates that this is not a particularly useful view for full dome projection, unless one was interested in the ceiling. Commonly the front view vector is orientated down from what would normally considered the front, the result is that the front view center is raised above the spring line of the dome. Where "c" specifies the view and is a single letter from 'f', 'l', 'r', 't', 'b'. "s" is the name of the sequence, a string (length limits unknown). "nnnnn" is the sequence number for the animation, starting from 00000 and zero padded (%05d in C printf() format). l_starmap_00000.tga, r_starmap_00000.tga, f_starmap_00000.tga, t_starmap_00000.tga, b_starmap_00000.tga. l_starmap_00001.tga, r_starmap_00001.tga, f_starmap_00001.tga, t_starmap_00001.tga, b_starmap_00001.tga. Previewing the images without a dome or projection system is an interesting exercise. One straightforward approach is to create a composite image made up out of the 5 pieces, some examples of these can be seen in the examples section below. It is a straightforward extension to place texture images on the folded out faces of the cube and even to animate these textures. 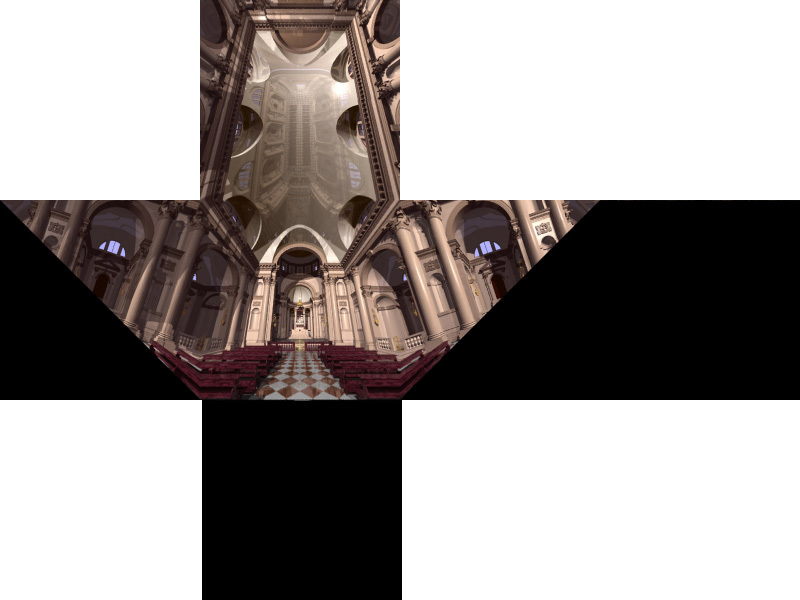 One model provided is a sphere, here the poles are aligned to be on the left and right of the viewer. The faces of the cube are spread out by about 30 degrees. 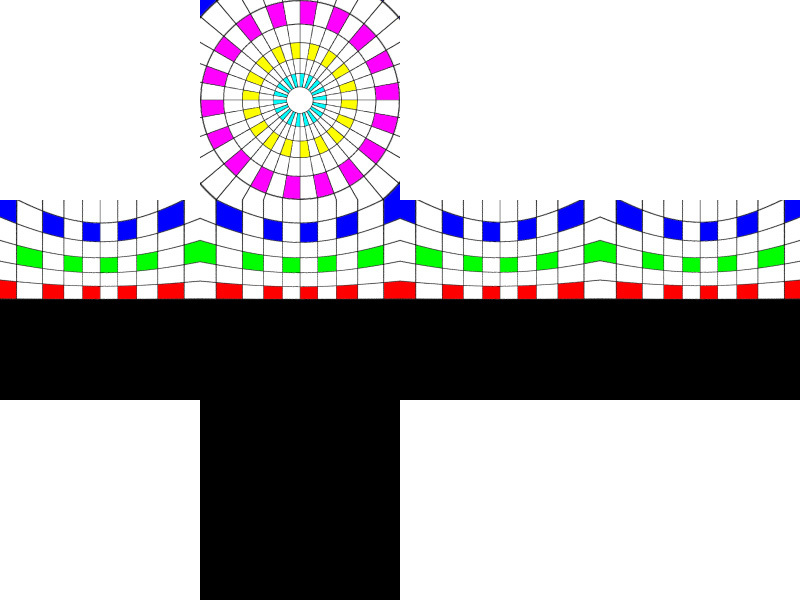 Construction lines outline the boundary of the faces and the 50% boundary on the surrounding faces. The faces of the cube can be flattened out to lie on a plane. The faces of the cube can be moved to their original positions as if they formed a cube. Another model is a room with each pair of faces a different colour. The camera rotated so it isn't aligned with the faces of the room. This view is with the faces of the cube closed up and the camera aperture exactly at the 50% point of the side faces. The nice thing about this form of display is that the images don't need to be changed from those sent to SkySkan for processing. Unfortunately watching animations in this mode it rather distracting because the back view on the right is often doing the opposite of the front view. These have been rendered at 1000x1000 pixels for each view. They are based upon the Mola 1/8 degree topology data. The animation, which is far to large to display here, consisted of 1800 frames representing 3 days, the first day consisted of a the planet without modification, the second day sees the sea level increasing, clouds introduced, and vegetation grown. The frames on the right are samples from three points in time. The rendering was performed in PovRay. In the sequence, not only is Mars transforming but it is rotating. While this sort of display of the movie is good to verify the correctness of all the frames, it is very hard to appreciate how the material will look in the dome. For example, it isn't easy to mentally join the top edge of the left and right pieces to the left and right edge of the top piece. A much better alternative would be for content creators to be able create the fisheye masters, watching a fisheye lens movie while introducing other distortion at least provides image continuity. The following illustrates one possible method of instructing PovRay to create the 5 views automatically. Note that the image renaming and stitching together was performed using external scripts. The Povray scene file and initialisation file are: cube.pov and cube.ini. It is straightforward to create the 5 views from existing OpenGL applications. One simply creates view directions and up vectors for each view and calls gluPerspective() or glFrustrum() appropriately, render each view and save the resulting image to disk using glReadPixels(). The example shown here is from a flight through the 2dF galaxy dataset. Depending on the implementation it is not generally possible to use light sources that are positioned relative to the camera (at least not related to the right or up vector of the camera). Care must be taken with antialiasing and the possible edge effects. 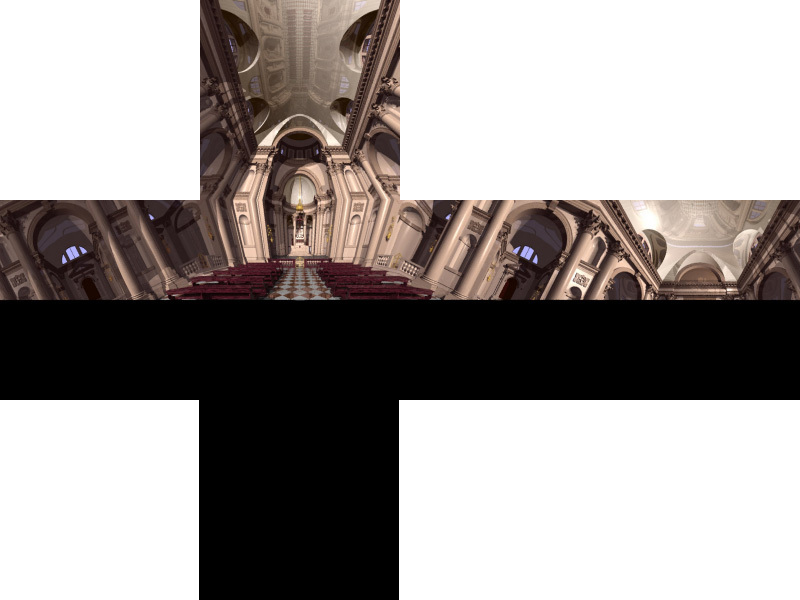 Most rendering packages employ some sort of supersampling which is local to a particular pixel. Some methods and filtering approaches use information from a wider region around a pixel. This can result in borders along the seams of the cube. Any filtering should be left until after the images have been turned into a fisheye master. 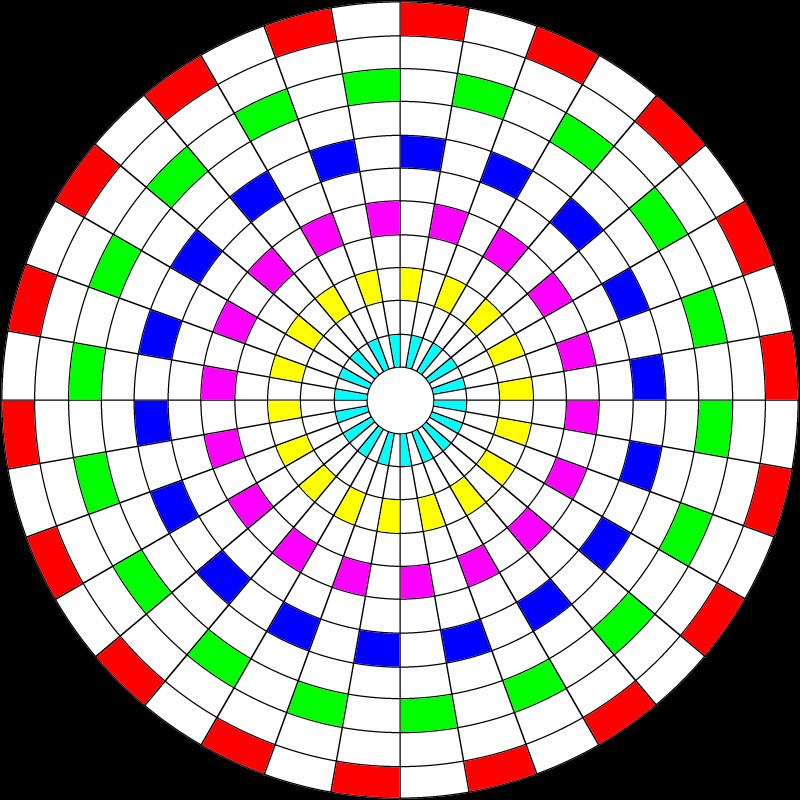 The inverse operation is clearly possible, that is, converting an angular fisheye image into as much of the 6 cubic maps as is provided by the fisheye.